Directions: Shake can well, holding it upside down and dispense a palm full of mousse into hand. 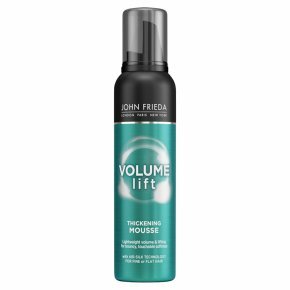 Spread evenly through towel-dried hair, then blow-dry and style to maximise your volume. DANGER: EXTREMELY FLAMMABLE AEROSOL.. Pressurised container: May burst if heated. Protect from sunlight. Do not expose to temperatures exceeding 50�C/122�F. Do not spray on an open flame or other ignition source. Keep away from heat, hot surfaces, sparks, open flames and other ignition sources. No smoking. Do not smoke during use or until hair is fully dry. Keep out of reach of children. Use only as directed. Intentional misuse by deliberately concentrating and inhaling contents can be harmful or fatal. Do not pierce or burn, even after use. When container is completely empty, it can be discarded. For external use only.